After returning from a patrol on Ocean Station Bravo on 20 March 1968, the crew learned that they were soon to be en route to the waters off Vietnam. Here she was assigned to join Coast Guard Squadron Three, which consisted of high endurance cutters that were participating in the Navy's Operation Market Time interdiction and coastal surveillance effort in Vietnam. After refresher training, she arrived in theatre on 16 July 1968. INGHAM was one of five cutters and seven Navy DERs assigned to Task Unit 70.8.5. She rotated duty with these other vessels patrolling in Vietnamese waters, these patrols lasting upwards of 30 days, alternating duty in other Asian ports for upkeep, maintenance and liberty as well as serving as the U.S. station ship in Hong Kong. While patrolling off Vietnam, INGHAM's task was to prevent the infiltration of arms, ammunition, and supplies to communist forces in South Vietnam by stopping, boarding and searching vessels in her area of operation. She was also called upon to conduct naval gunfire support missions (known as NGSF) for friendly ground forces. Her traditional search and rescue duties were also needed on occasion and her medical staff visited local villages, on missions known as "MEDCAPS," (for Medical Civic Action Program) to provide medical aid to the local populace and military personnel stationed in the area. She also lent logistical support to the Navy and Coast Guard patrol boats serving in her area of operations. "As soon as INGHAM had been eased away from her berth at the Subic Bay Naval Base in the Philippines by two Navy tugs, her Executive Officer, Lieutenant Commander Joseph Wubbold of San Gabriel, Calif., nudged his ship's two steam-powered turbine engines forward and moved the cutter slowly toward the fueling pier a short distance away. INGHAM had just ended a drydocking period and while she was out of the water her crew repainted her hull until it was gleaming white. That, along with her distinctive red slash and Coast Guard seal painted at a rakish angle across the port and starboard sides of her bow put her in sharp contrast with the gray of Navy ships which surrounded her. . .Fueling completed, Captain Neale O. Westfall of Portsmouth, Va., INGHAM's skipper, directed that his ship be headed for her 'on line' assignment in the waters off South Vietnam, this time in an area about halfway up the coast. . .Arrival [two days later] on station always means a flurry of activities and no exception in made for the men of INGHAM. 'On station' came for them at 5 a.m. 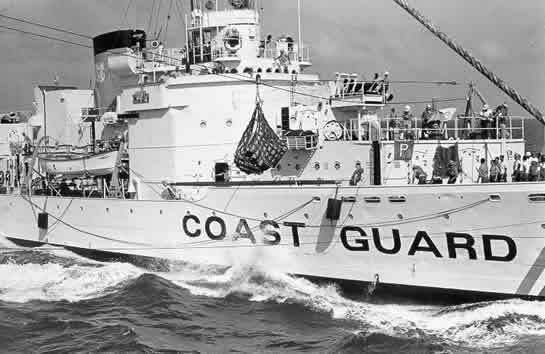 In the light of a just-rising sun, Coast Guardsmen in a small powerboat were lowered over the side for the short ride to another Coast Guard high endurance cutter, the Winnebago. The Winnebago is the ship being relieved, and once aboard her, officers and key personnel quickly exchanged information and equipment. Within a half hour INGHAM men were riding back to their ship. Within a few hours after officially assuming the 'watch,' Coastal Surveillance Force headquarters for the area in which INGHAM was to patrol called the cutter to arrange a briefing conference. As this was to take place ashore in South Vietnam, INGHAM moved off the line toward the country. No sooner had the briefing ended and the cutter on her way back to the line that she was called on for naval gunfire support. Gunfire support consists of shelling selected enemy targets ashore, as identified by a command point somewhere in South Vietnam. INGHAM had a variety of targets to hit and would be firing with the aid of a 'spotter.' . . .For the next two days, Coast Guardsmen manning the cutter's five-inch, 38-caliber naval gun under the direction of Chief Petty Officer Leon R. Scarborough of Hatteras, N.C., dropped charge after charge on the beach and mountainous coastal terrain. Her targets? Primarily a site used as a regrouping area by the enemy and a cache of enemy supplies. While shooting, Captain Westfall dropped his ship's anchor to provide greater stability for INGHAM. However, at one point, INGHAM's guncrew was firing 'from the hip' so to speak. As the cutter steamed along slowly off the coast, her shooters raked the beaches with heavy projectiles. In between gunshoots and regular surveillance, INGHAM had a few visitors. Nearby Navy 'Swift' boats, powerful 50-foot long but heavily armed patrol boats came alongside for water and other provisions which they cannot carry for long periods of time. Also, a few of the familiar Coast Guard 82-foot patrol boats dropped in for the same reason. These smaller craft are also part of Market Time operations and carry out close inshore river patrols while the larger ships conduct the 'outer barrier' patrols some 20 miles offshore. . .Later on that day, INGHAM had an 'unrep' (underway replenishment). This consists of the transfer of fuel and material to INGHAM from another vessel designed for this by the use of hoses and lines as the two ships steam beside each other 80 to 120 feet apart at about 18 to 20 miles per hour." INGHAM returned to Norfolk, arriving there on 2 May 1969. She spent a total of 12 months on this deployment and steamed for over 60,000 miles. She had conducted dozens of naval gunfire support missions, firing on Viet Cong positions in support of ground troops ashore. During one mission in support of the 9th Infantry Division of the Army of the Republic of Vietnam in January of 1969 INGHAM was credited with destroying three and damaging 15 enemy structures. During her deployment, she received a total of 58 underway replenishments and replenished many Navy Swift boats and Coast Guard 82-foot patrol boats herself. She participated in Operation Sea Lords and Operation Swift Raiders, earning an unprecedented two Presidential Unit Citations, the only cutter to be so honored. INGHAM also carried on her traditional humanitarian responsibilities. She had assisted a disabled Vietnamese naval junk, taking it under tow, and thereby saving the junk and her four man crew. She also stood by a grounded Coast Guard 82-foot patrol boat until it was refloated and her medical team treated a number of Vietnamese, including those in the village of Song Ong Doc, as well as saving the life of a Thai fisherman who had been injured.